Over 40 user interaction enthusiasts connected through Front Range UXPA to meet up for an informative and creative discussion on intuitive design. Everett McKay was the main speaker. His work history with Microsoft was a reflection to his dedication to the user experience. After locating the venue and getting settled in, McKay personally walked up to me and introduced himself. 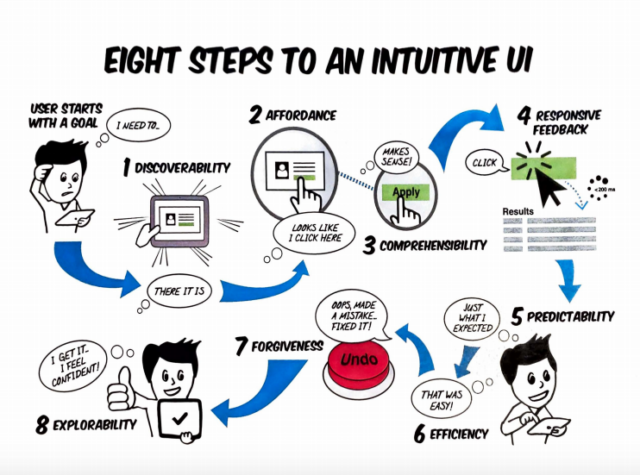 He provided a physical document with his eight steps to intuitive design to review. One of the takeaways for me was his detailed definition of user interaction (UI) design that is intuitive. He summarizes this point by saying the most effective form of intuitive design is self-explanatory. The class was engaged and interacted in discussion. One of the discussion points that caught my ear was McKay’s experience with using familiarity to deliver a user-friendly design. He also showed a counterpoint to that by pointing out that too much familiarity could stifle innovation.